US Airways will hike the price of a trip between Pittsburgh and Philadelphia in January to nearly $700 roundtrip. NEW YORK (CNNMoney) -- Right now, $118 will buy you a roundtrip ticket on the 45-minute US Airways jaunt from Pittsburgh to Philadelphia. Starting on Jan. 8, the price of that same ticket will skyrocket to $698, according to price data on the airline's website. Why? Southwest Airlines (LUV, Fortune 500), the only other carrier that flies the route without connections, is dropping service -- leaving US Airways as the only nonstop option for fliers who need to span Pennsylvania in a hurry. "This should be expected," said Michael Boyd, president of Boyd International Group, an airline consulting and research firm. "It's what happens when there is less competition." 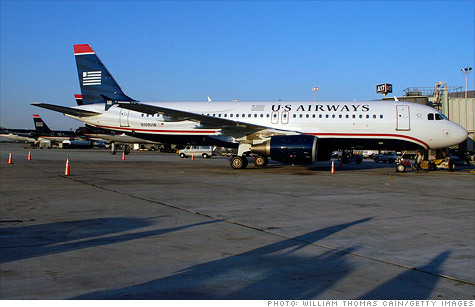 US Airways (LCC, Fortune 500) declined to comment on the fare increase. "I can tell you in general terms that pricing decisions are made based on demand and what the market will bear," spokesperson Todd Lehmacher said. A Southwest spokeswoman said the airline decided to cancel the flight because it wasn't selling enough tickets. "Pittsburgh to Philadelphia service is being discontinued because we are not seeing the passenger demand we used to," Brandy King said. Boyd estimates that Southwest's Pittsburgh to Philadelphia flights are only about 52% full, while US Airways flights are at 75% of capacity. "The price increase is just a reflection of [US Airways'] new hold on that market," Boyd says. "This is the nature of the airline business." Fare hikes are not exclusive to US Airways, of course. According to U.S. Bureau of Transportation statistics, the average domestic air fare was $356 in the first quarter of 2011, an 8.4% rise from the $328 average in first quarter 2010. Nor is Pennsylvania the only place where airlines are reevaluating their short-haul flights. For example, Southwest has also announced it will discontinue its direct flights in Washington between Spokane and Seattle in January 2012. Boyd added: "Albany to Buffalo was a popular route in the early '80s with 35,000 or 40,000 flyers a year. Those numbers dwindled and there are no longer any non-stop options." In Pennsylvania, the recent change leaves travelers without a lot of good options. They could seek out cheaper flights that connect through other airports, but this could extend travel times. Delta, for example, flies the route but with layovers in Detroit and make the trip a near six-hour trek. Or there's always driving the 300-plus miles between Pittsburgh and Philadelphia. Correction: An earlier version misquoted Boyd as saying the Albany to Buffalo route saw 35,000 to 40,000 flyers a day. It was actually 35,000 to 40,000 flyers a year.